Said Governor Patray: "The CBL has no record showing that monies printed under its authority have not yet been delivered into its reserve vaults. Records from Crane Currency of Sweden, which was contacted to print the money, show that Crane delivered L$15.5 billion through the Freeport of Monrovia and the Roberts International Airport between 2016 and 2018, and that all these monies were logged by the CBL and delivered into the reserve vaults of the CBL." Contacted by FrontPageAfrica last week, Craig Conrad, Communications Director for the company said it is against Crane's policy to comment on matters relating to their clients. "Thank you for your interest in Crane Currency. We do not comment on the business of our valued customers and would encourage you to contact the Central Bank of Liberia for the information you are seeking", Mr. Conrad said, in an email seeking inquiry Wednesday. 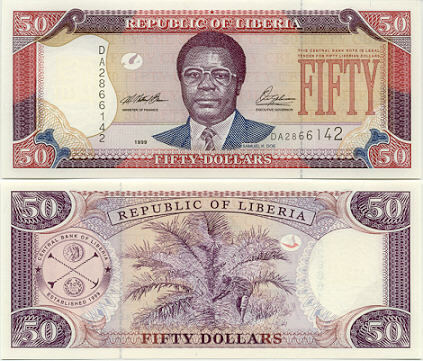 One of those conditions is that Crane would print and supply Liberian Dollars bank notes in six(6) denominations to the Bank in accordance with the agreed Designs and Specifications in United States Dollars per 1000 units of notes, including delivery according to the CIP Sea Port of Monrovia and to include goods and issuance for a maximum of 110% of the replacement value of the goods despatched to the Port of Monrovia. "Shipment by air to Monrovia shall be at the request of the bank and any air shipment shall be charged at cost in addition to and separately from the prices quoted." According to the contract, prices for the order as offered by the company and accepted by the Bank was set at US$10 million. "That the price for the order is Sixty-two United States, fifty-eight cents(62.58) per thousand(1,000 pieces) as provided in Appendix B. The total price for one hundred and sixty-one million, seven hundred and forty thousand(161,740,000) pieces of Liberian dollar banknotes spread across six denominations in volumes enumerated in (Appendix B), Quantity, above, is Ten Million, One Hundred and Twenty-One Thousand, Six Hundred and Eighty Nine United States Dollars(($10,121,689). The Bank shall make a down payment of forty(40%) of the total price which equals Four Million, Forty-Eight Thousand, Six Hundred and Seventy-Five United States Dollars and Sixty Cents(US$54,048,675.60. followed by pro rata payments made against deliveries until such time as the order shall have been discharged and the final balancing payment is made against receipt by the Bank of the final consignment." As part of the conditions the contract stipulates that late availability of banknotes by the Crane would attract a penalty of half percent of the invoice value per week in respect of the first sixty percent of the banknotes. "A similar penalty shall also apply in the case of late availability of the remaining quantity of banknotes. However, in order to meet the Availability Schedule the bank shall expressly respond to all requests for approval in a timely manner."